M&A activity has been at a high level in the accounting and law sectors for a number of years now; and the indications are that this trend is set to continue. For those who plan to sell, it is important to prepare the deal with a clear focus on the assets that are important to acquirers and which drive the value of the business. Here, Christof Binder, the co-founder of Trademark Comparables AG, a Swiss firm engaged in valuation support and comparable data, sets out what these are. Accountancy and law firms are frequently engaged as advisers in selling and acquiring businesses on behalf of their clients, and on finding and auditing the value related to such transactions. But for their own firms, many accountants and legal professionals have no precise conception of value and price. Mergers in the professional services sector remain a popular strategy among entities looking to boost revenues and acquire new clients, and among those professionals who seek to exit. As most players are private companies, and some sectors have specific requirements which do not permit external equity investments, the financial terms of takeovers are rarely disclosed. Therefore, when contemplating such deals it is important to understand more about valuation multiples, and about the levers driving them, with a particular focus on the audit/accounting and law sectors. A sample of takeovers of such firms by public companies which were subsequently reported in the financial statements of the acquirers (purchase price allocations) provides the basis for a deeper analysis. 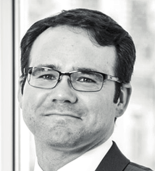 Beyond the purchase considerations paid, the structure of the acquired assets was analysed. The sample covers 18 acquisitions of accounting and law firms between 2006 and 2016 in the US, the UK and Australia. The targets range from US$7 to US$ 129 million in revenues (the sample is taken from the MARKABLES database and published in the Feb 2017 snapshot). Earnings multiples typically range from 6x to 8x EBITDA, or 11x to 14x net income after tax. These are rather moderate multiples, reflecting the limited scalability and growth potential of people-based services where capacity is always a limiting factor. Sales multiples typically range from 1.3x to 2.2x revenues, depending on profitability. 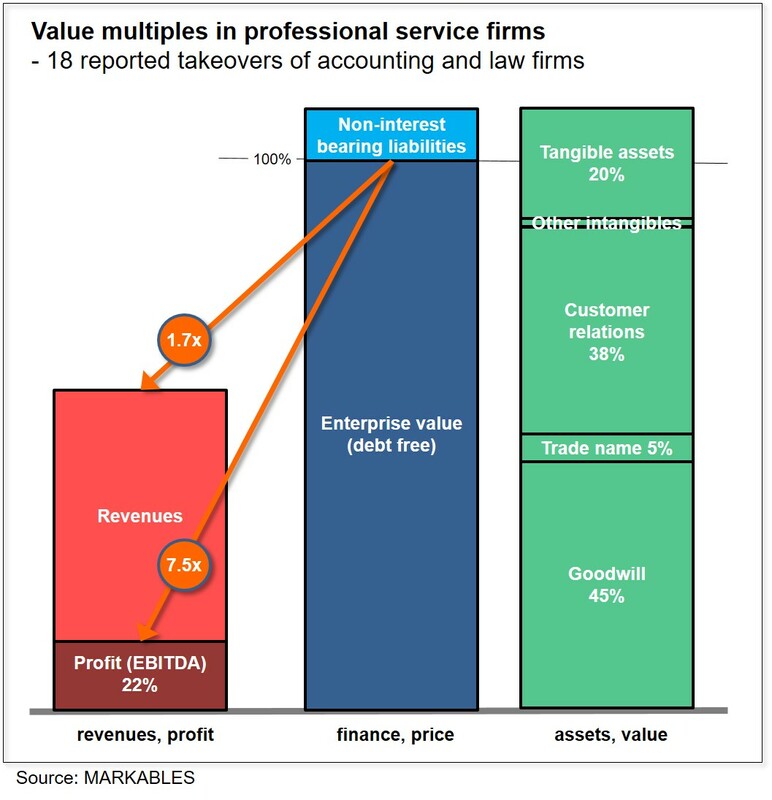 Professional service businesses are highly profitable; typical profit margins range from 15% to 30% on revenues (EBITDA). Accountancy and law firms are primarily acquired for the value of their existing clients. Customer relations account for 38% of enterprise value on average. 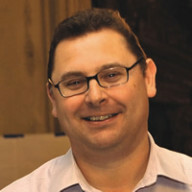 Customer value is influenced by the stability of customer relations, (repeat business, such as IP lawyers and auditors, or project business, like litigation or corporate finance advisory), excess margin (higher on projects, lower on ongoing repeat business), and by the independence of customer relations from key individuals. Over the total sample, the customer asset has a relatively short remaining life of 10 years. Eventually, customer value must be secured through non-compete and/or ESOP arrangements to prevent key individuals from leaving and taking clients with them. The trade name of the firm is of minor overall importance. However, its reputational value has an important role to “replenish” short-lived customer relations in project-based businesses. The reputational value of the trade name not only helps to create future customer relations, but also to attract new talent to the firm. Still, the trade name accounts for only 4% of enterprise value on average. Depending on the background of the transaction (ie, new territory or consolidation), the trade name of the acquired firm is assumed to be kept and maintained in eight of the 18 cases. In the other 10 cases, the acquirer plans to replace the trade name of the target by its own name over time, on average within four years of the takeover. This translates to an implied royalty rate for the trade name of 1.5% on revenues under a royalty relief valuation. Other intangible assets typically include software and non-compete agreements, and are insignificant with less than 1% of enterprise value. Tangible assets account for 20% of enterprise value. They include a smaller percentage for fixed assets like office equipment and company cars, but consist largely of liquid financial assets and receivables. Typically, such businesses are fully self-financed. Therefore, tangible assets (book value) are financed free of debt and do not increase enterprise value. One important asset remains: goodwill - with a share of 45% of enterprise value. But this should not be taken as a pure “residual”. It includes a number of components. One is cost savings expected from the combination. Another more important one is the cross-selling potential in combining different territories, customer groups or service ranges. And, lastly, goodwill includes the ability of the acquired firm to master the future beyond the current planning horizon, in particular to create enough new business to keep the firm running at its current profit level. For professional services firms, retaining key individuals is vital for this. A high price for a professional service firm must therefore include clear measures to retain key staff.